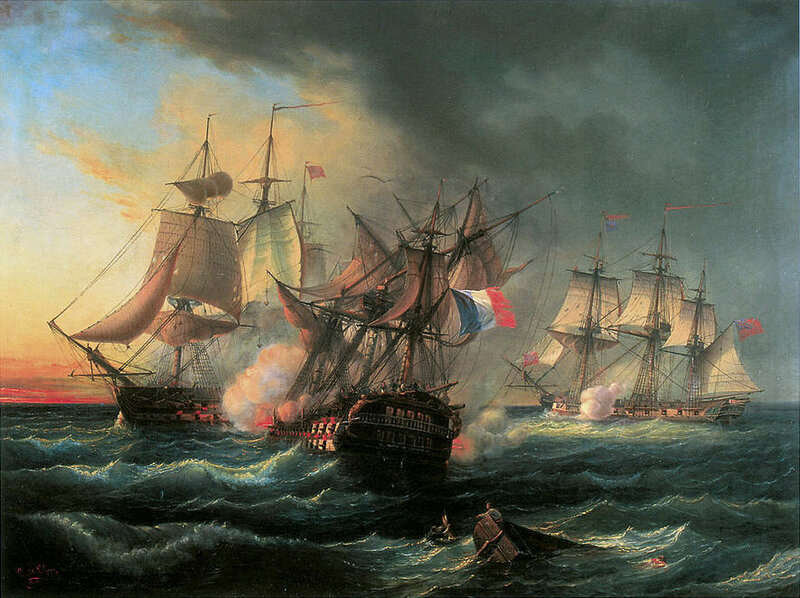 Besides their few major fleet actions, the French Revolutionary and Napoleonic Wars saw many vicious encounters between small numbers of French and British ships which have since provided the inspiration for much naval fiction. 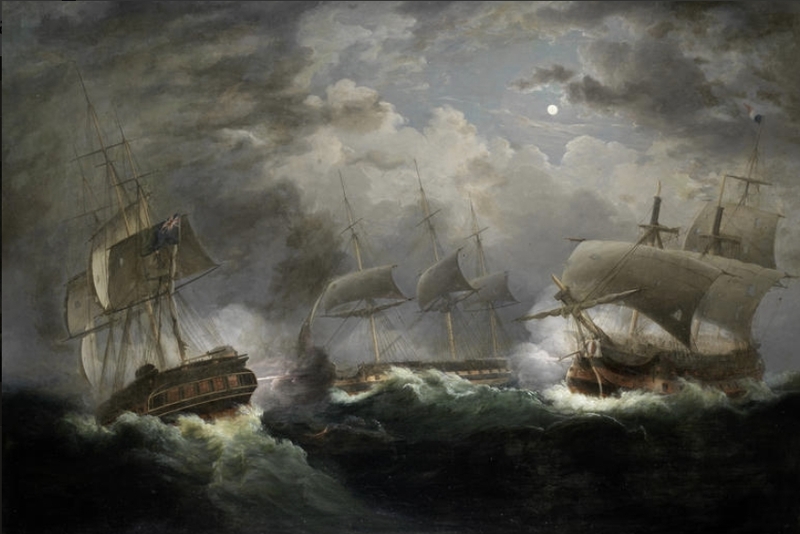 One of the most ferocious of these battles was fought in the darkness of a stormy winter night off the coast of Brittany in early 1797 and it established Sir Edward Pellew, later to be Lord Exmouth, as the foremost frigate captain of the era. In December 1796, eager to exploit rebellious sentiment in Ireland against British rule, and urged on by Irish exiles, the French Revolutionary Government sent a huge naval and military expedition to open a new theatre of war in Britain’s own backyard. The choice of December may seem a strange one, due to the poor weather that could be expected, but the French relied on this to allow their ships to slip past the blockading Royal Navy squadrons. The French force left their base at Brest, in Brittany, on December 16th 1796 – seventeen ships-of the-line, thirteen frigates, six corvettes, seven transports, and a store ship. They carried some 20,000 troops under the command of the renowned General Lazare Hoche (1768-97) who, but for his early death (possibly by poison), could have been a rival to Napoleon for supreme power in France. Overall commander was Admiral Morard de Galles, who had established his reputation as one of the great Admiral Suffren’s most successful captains. Brest was under observation by the Royal Navy’s inshore squadron, under Captain Sir Edward Pellew (1757-1833), seen on the right, who was already on the way to proving himself one of the great commanders of the era. The squadron consisted of four frigates, Pellew himself in the Indefatigable, a 44-gun heavy frigate, as well as the Revolutionnaire (a French prize taken into British service), the Phoebe, and the Amazon. 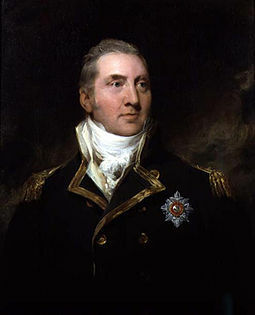 When Pellew saw the French emerge he sent off the Revolutionnaire to alert Admiral Sir John Colpoys, who with fifteen of the line would have normally been closer inshore, but who had been blown off station by the same strong easterly winds that facilitated the French departure. 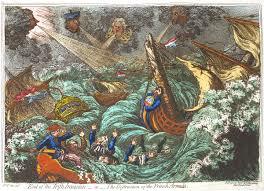 The Revolution had deprived the French Navy of many of its most experienced officers and indiscipline was rampant. Insufficient attention had been paid to training and the presence of strong British forces offshore limited opportunities for building ship-handling experience. The result was that even in the absence of strong Royal Navy forces de Galles’ fleet, badly handled in strong wind, lost cohesion on its first day at sea. As darkness came on, Pellew edged down among the mob of French ships. When de Galles signalled with guns, rockets, and blue lights, Pellew did the same, with variations of his own, completely confusing the French captains. Amid the general disorder that followed, one of the French 74’s, the Seduisant, drove on to a rock and became a total wreck. From 1300 on board only some 600 were saved. Despite this setback the French evaded Colpoys’ squadron and reached Bantry Bay, in South-West Ireland, in late December. Here storms and fog made landing impossible and the decision was taken to abandon the expedition and return to France. Had it landed, the course of Irish history might have been changed radically. The French straggled home in ones and twos and threes, no longer a fleet. On the January 13th, one of the French 74’s, the Droits de l’Homme, commanded by a Captain Raymond de Lacrosse, found herself alone off the Britany coast. Visibility was poor and Lacrosse decided to approach no nearer but to sail southward under easy sail, the wind on his starboard beam. In mid-afternoon two sails were spotted on the lee bow, between the Droits de l’Homme and the land. These proved to be Pellew’s Indefatigable, in company with a 36-gun 18-pounder frigate, the Amazon, commanded by a Captain Robert Reynolds (1745 – 1811). Pellew immediately signalled to the Amazon to give chase, and steered towards the enemy, sailing considerably faster than his smaller consort in the heavy sea. On this winter day dusk fell about four-thirty and the wind, which had been fresh all day, blew a full gale. As darkness came on the Droits de l’Homme lost her fore and main topmasts in a violent squall. Fearing that there might be yet more British ships about, Lacrosse altered course to eastward, and ran straight before the gale, hoping to reach the channel leading to Brest. It was a dangerous decision, as he cannot have been certain about his exact position, and should he have mistaken his landfall, there would be no chance for a crippled ship on a lee shore in such conditions. At five-thirty the Indefatigable, in near darkness and under close-reefed topsails, surged across the Droits de l’Homme’s stern and raked her. The French ship had nearly a thousand troops on board and they peppered the Indefatigable with musket fire as she passed. Pellew’s manoeuvre brought the two vessels so close together that the ensign staff of the French ship fouled the Indefatigable’s mizzen rigging and British seamen dragged the tattered remains of the French tricolour on to their own quarterdeck. Lacrosse now tried to bring his vessel alongside, possibly with a view to boarding, difficult as the high seas running would make it, but Pellew managed to sheer away. The Droits de l’Homme’s bowsprit actually grazed Indefatigable’s spanker boom, and she in turn suffered raking fire as she turned away. For the next hour and more the Indefatigable engaged the French ship-of-the-line single-handedly. In her favour was the fact that in the heavy sea that was running Lacrosse hardly dared open his lower deck gun-ports, and thus lost use of his 36-pounders, his most formidable weapons. 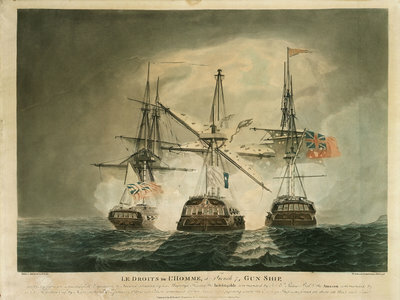 The Droits de l’Homme carried 18-pounders in her upper tier, while the Indefatigable had an unusually powerful armament for a frigate – 24-pounders on the gun-deck and 42-pounder carronades on the poop and forecastle. In spite of the sea she fought her 24-pounders right through the action. The loss of his topmasts made it impossible for Lacrosse to steady his ship, and she rolled so furiously that her gunners and small-arms men found aiming difficult. The Amazon arrived out of the darkness shortly before seven o’clock. She blasted a broadside into the Droits de l’Homme but swift action by Lacrosse avoided raking through the stern. 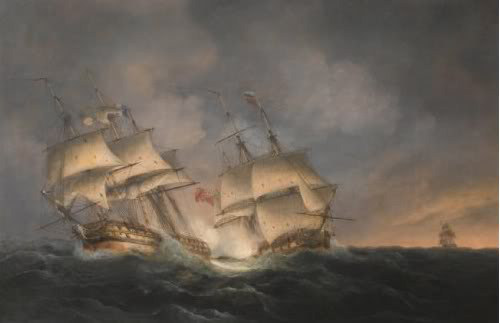 The Amazon’s manoeuvre had brought both British frigates on the same side of the French ship, masking each other’s fire, so at seven-thirty they both pulled ahead of the enemy. Pellew seems to have been particularly concerned to repair damage to his rigging. The Droits de l’Homme also needed a respite badly – heavy casualties had been sustained and poor discipline and training had resulted in considerable confusion – but it proved a short one. An hour later Pellew’s two frigates resumed their attack, stationing themselves one on either side of the enemy, and manoeuvring so as to rake her alternately. The Droits de l’Homme attempted to yaw first one way and then the other in order to return their fire, but without much success. It is hard to visualise just how ghastly the scene must have been – the high waves, the screaming wind, the crashing guns, the cries of the injured and dying, the enveloping darkness and choking clouds of smoke illuminated by the deafening gunfire. This continued for over two hours. At ten-thirty the Droits de l’Homme’s mizzen-mast went overboard, and the frigates now positioned themselves off her port and starboard quarter, firing grapeshot so as to hinder any attempt at rigging a jury-mast. Both British ships were rolling so violently that their guns’ breechings – their restraining ropes – were parting and iron ring-bolts in the deck, to which they were fastened were being torn free. The brutal pounding march continued through the night, so heavy that by midnight the French vessel’s store of roundshot was exhausted. And still the British ships blasted without let-up. At four in the morning, long before daylight, a look-out on the Indefatigable reported land directly ahead. Pellew immediately signalled the danger to the Amazon, and hauled his wind southwards, while the Amazon bore away to the north. The Droits de l’Homme, possibly oblivious to the danger, held straight on. All three ships were now in extreme peril. Attack had proved the best form of defence for the Indefatigable – her crew’s superior gunnery skills had seen to that. Almost miraculously, no one had been killed and fewer than twenty were wounded, half of them only slightly. She had however suffered severe damage aloft – the French were known for aiming for masts, spars and rigging. The most significant damage was that the shrouds of the maintop-mast had been severed. Should this mast fall then Indefatigable could not hope to beat off a lee shore in strong wind under her fore and mizzen topsails only. The hero of the hour proved to be the seaman who was captain of the maintop. He went aloft and somehow reached the lurching topmast-head. The end of a hawser was passed up to him and he managed to secure it around the head of the mast. The other end was made fast below and the mast was stabilised. This was perhaps the most heroic exploit of the battle for it was accomplished in darkness, and in a gale, with the swaying topmast threatening to go over at every moment, taking the seaman with it. The Indefatigable stood to the south, close-hauled. Then, in the light of dawn, breakers were seen ahead, astern and to starboard. Blindly running before the gale during the night action, all three ships had been entrapped in Brittany’s Audierne Bay. Pellew wore ship – he “jibed”, a difficult manoeuvre for a square-rigged ship at any time and a daunting one for a damaged one and in the teeth of a gale. Superb professionalism by officers and men alike proved it successful and through the morning Pellew worked towards the safety of the open sea. The Amazon was less lucky. She had taken higher casualties – three killed and fifteen badly wounded – and her masts and spars were badly damaged. Her mizzen topmast, gaff, spanker -boom, and main-topsail yard were gone, and her sails were in shreds. She ran on shore and broke up, but not before all but six of her disciplined crew all came safely ashore on rafts. They were immediately surrounded by French troops and marched off into captivity. It is pleasing to learn that they were well treated. Amazon’s Captain Reynolds was later honourably acquitted by a court martial for the loss of his ship, and his two lieutenants were promoted. A worse fate awaited the Droits de l’Homme. She too ran on to rocks but discipline seems to have broken down and officers proved incapable or regaining control. For the next four days the survivors clung, cold and starving, to the remains of the wreck until a French brig managed to reach them and get them ashore. Among the survivors clung, cold and starving, to the remains of the wreck until a French brig managed to reach them and get them ashore. Among the survivors was General Jean Joseph Amable Humbert (1767 –1823), who the following year was successful in landing a small French army in Ireland. Humbert’s life was a fascinating – and unlikely – one and worthy of a separate blog in the future. In the action the Droits de l’Homme lost over 100 killed, and 150 wounded, from the gunfire of Pellew’s frigates. A British naval officer who was a prisoner on board, and survived, though barely, claimed that after she had run on the rocks about 1000 men drowned or died of starvation and exposure. Just over 400 were saved. 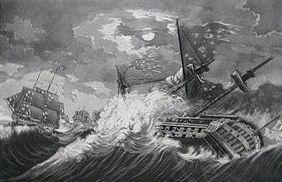 Pellew’s reputation and fame, already great, reached new levels after this action which was perhaps the only instance of a ship-of-the-line being destroyed by frigates. The circumstances were however exceptional and few captains other than Pellew would have dared turn storm and darkness into weapons against the larger ship.